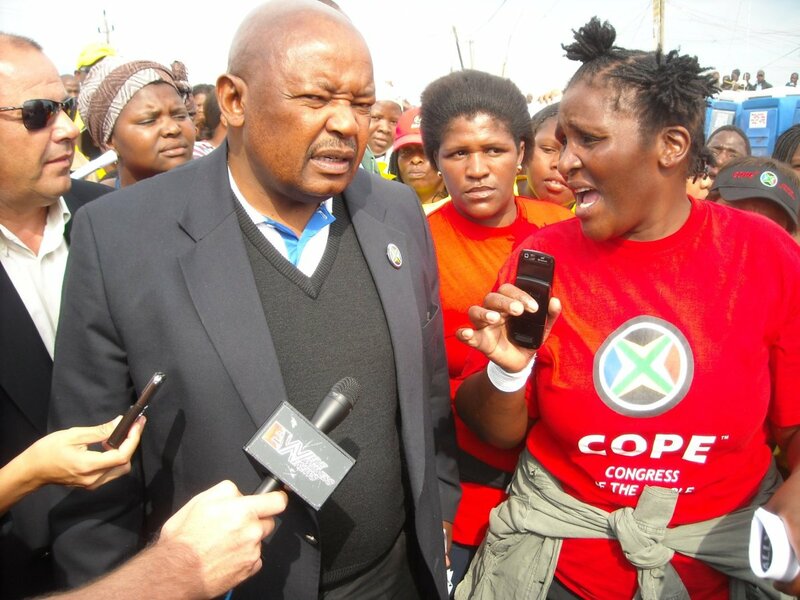 Demolished shacks, overcrowded conditions, illegal electricity connections and streets piled with rubbish were some of the conditions witnessed by Congress of the People (COPE) president Mosiuoa Lekota when he visited the ANC stronghold of Du Noon township in Cape Town yesterday (16/04/2009). Lekota, who is on a three-day blitzkrieg campaigning mission to shore up support in Cape Town, was given a jubilant welcome by hundreds of supporters when he arrived in his chauffeur-driven car. Rubbish has been piling up in the streets of Du Noon due to a row between a local ANC councilor and the City of Cape Town over the procedure for hiring staff to work on a waste removal contract. The company appointed to do waste removal in the township has not been able to begin work due to the impasse. To cheers from the crowd, Lekota tackled the issue, accusing the ANC of wanting to secure jobs for relatives and friends. Speaking from the back of a bakkie parked in Usasadza Road, one of the main roads through the township, Lekota accused the ruling party of attacking the institutions of democracy and called for Jacob Zuma to have his day in court. He said South Africa needed a better leadership as “we cannot put someone at the heart of our affairs who is accused of multiple charges”. He said an increasing number of South Africans had realised that the ANC “has veered away from its commitments”. Speaking about the bombshell National Prosecuting Authority (NPA) announcement earlier this month that it would not proceed with the corruption case against Zuma, Lekota said national director of public prosecutions Mokotedi Mpshe had been unable to present credible arguments to the nation on his reasons for not proceeding with the case. Before addressing supporters, Lekota was taken to the adjoining Doornbach informal settlement and shown a tunnel running under Potsdam Road through which illegal electricity connections were threaded and where residents dump sewage. Du Noon resident Jonginkosi Menziwa said he had lived in a shack for ten years, but COPE had given him hope for a better future. “I think if we can elect COPE things in this township can change. If we can’t get houses at least maybe we can get electricity,” Menziwa said.